Brown butter cupcakes have a caramel-like taste and smell like a hot skillet of bubbling butter waiting for mom’s pancake batter to be poured on. If you’ve ever burnt dinner, you can burn butter and create unforgettable brown butter. 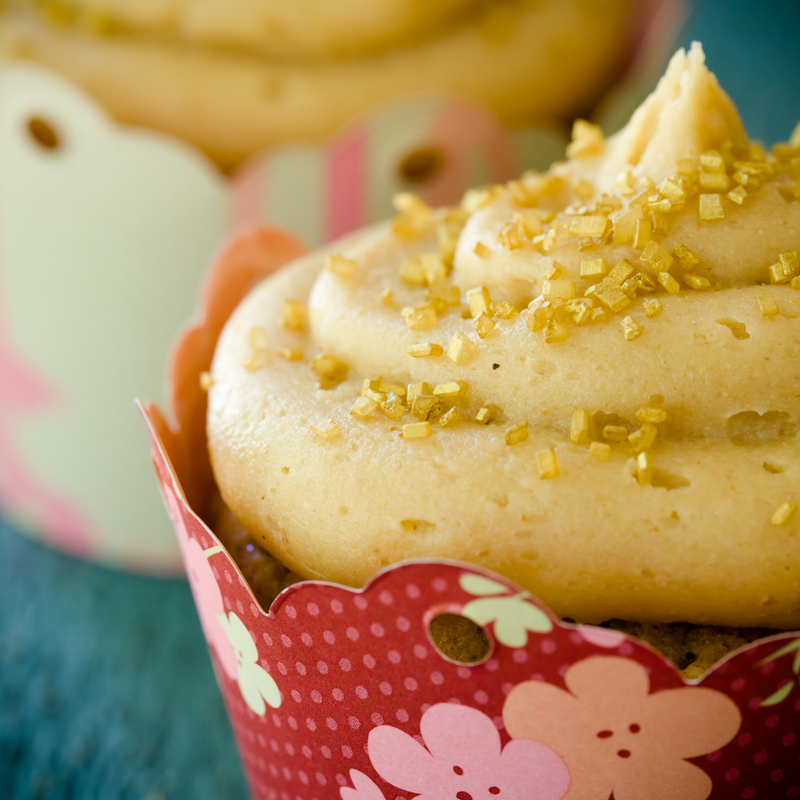 Brown butter cupcakes are basic, vanilla, butter-based cupcakes with the extra step of browning the butter. It’s a small step, but one that changes the cupcake flavor so much that it will seem like a huge brown bear step (Brown Bear, Brown Bear, What Do You See? I see delicious cupcakes looking at me!). 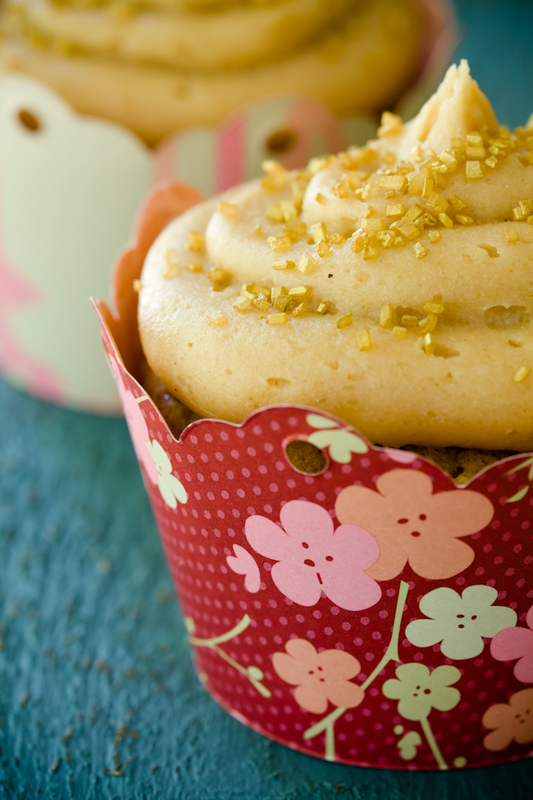 Frost the brown butter cupcakes with your favorite frosting. I think the cupcakes would be amazing with pumpkin pie frosting! I topped mine with lucuma cream cheese frosting (luca-whaa? Check out my post on lucama bars if you’ve never heard of lucuma). The mellow sweetness of the lucuma frosting shined in its own right, but didn’t overpower the brown butter. Brown butter cupcakes have a caramel-like taste and smell like a hot skillet of bubbling butter waiting for mom's pancake batter to be poured on. In a small mixing bowl, whisk together cake flour, baking powder, baking soda, and salt. In medium-sized bowl, whip egg whites until light and frothy. Slowly mix sugar into the egg whites. Mix cooled browned butter and vanilla into the wet mixture. Alternately mix dry ingredients and milk into the wet mixture. Mix butter and cream cheese until light and fluffy. Mix in lucuma powder. You may prefer a less pronounced lucuma flavor, so mix powder in small increments and taste periodically. Thank you to Navitas for the free sample of lucuma powder that I used in this recipe. Thank you to Incredible Stamping for the cupcake wrappers. Incredible Stamping generously donated a bunch of wrappers to our food blogger bake sale for Share Our Strength and gave me a few to try out. You’ll be seeing more of them! Note that Incredible Stamping doesn’t sell the wrappers, but sells the beautiful papers that you’ll need to make them yourself.